When an action star is trying to avoid the red lasers that could slice them in half in an action movie or crawling to avoid guards, these scenes are all staged and not really practical tactics for a modern criminal. But that didn't stop two thieves from slinking their way across the floor of the restaurant they were trying to rob. The owner of the restaurant said, "These guys watch too much TV, too many movies." 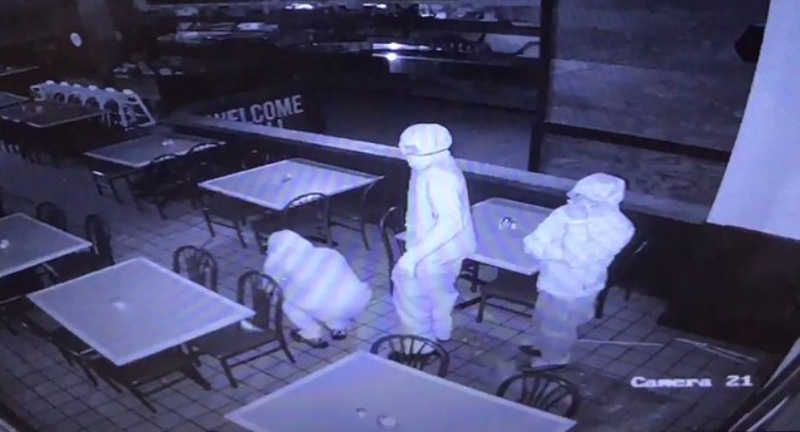 These not-so-bright crooks were on video the whole time they were crawling across the restaurant's floor. Jessi Juarez, the owner of the restaurant didn't find the tactics very amusing when he arrived to work one morning to find the front window had been smashed out and would-be crooks damaged his safe by trying to pry it open with a crowbar. The incident took place early Monday morning on Uvalde Road just south of Wallisville Road in Houston, Texas. The restaurant's owner Juarez installed CCTV cameras to deter, or in this case catch the burglars in the act. The surveillance system was installed just six months before the burglary. Fortunately, in the whole ten minutes that the crooks were there, the crooks didn't manage to get any cash but they did manage to steal some random items of little value. Juarez said, "They stole a drill, a speaker and a flashlight that they didn’t have when they came in." He says he is not worried about the burglars coming back but he did say he knew of two other businesses the thieves had targeted. The restaurant's owner had some sound advice for the unknown thugs, "They'll be too embarrassed to come out again. Leave us alone. Get a job. Get to work. Everyone else in this area works hard. Why can't they?" Big time thieves have to start somewhere.